Today the swell picked up for Round 4 of the ROXY Pro, with both Stephanie Gilmore and Bianca Buitendag winning their heats and progressing into the quarterfinals. Five-time world champion Stephanie Gilmore defeated Lakey Peterson in Heat 3, with an impressive 8.83 wave and a total score of 17.60. South African surfer Bianca Buitendag surfed against Nikki Van Dijk in Heat 3. Bianca pulled away with the win with a total score of 14.00 against Van Dijk’s 9.70. The quarterfinals will most likely take place tomorrow morning. 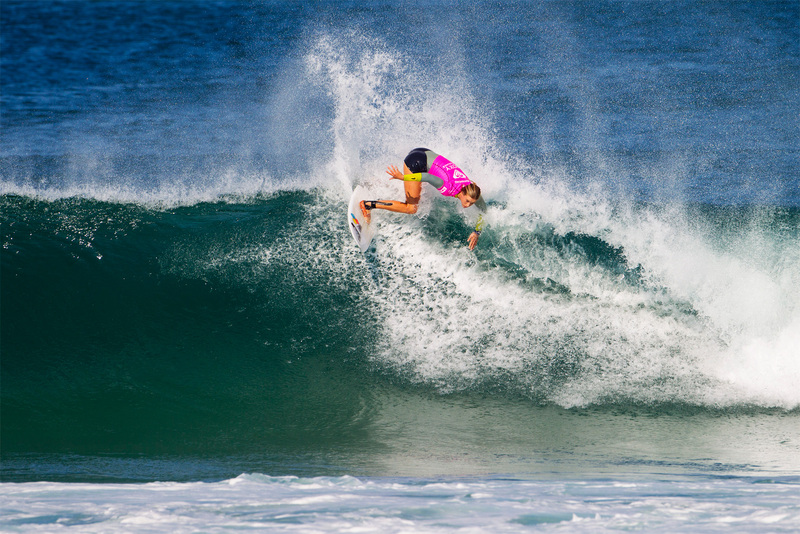 Sally Fitzgibbons will meet fellow Australian Tyler Wright in Heat 2. In Heat 3, Bianca will surf against American Courtney Conlogue. Stephanie will surf in Heat 4 against Hawiian Carissa Moore. Tune back tomorrow for updates from the Quarterfinals by following us on Twitter with the hashtag #ROXYPro!